GoLite Shangri-La 3 shelter and Exped DownMat UL. Taken with the Sony E 10-18mm lens. 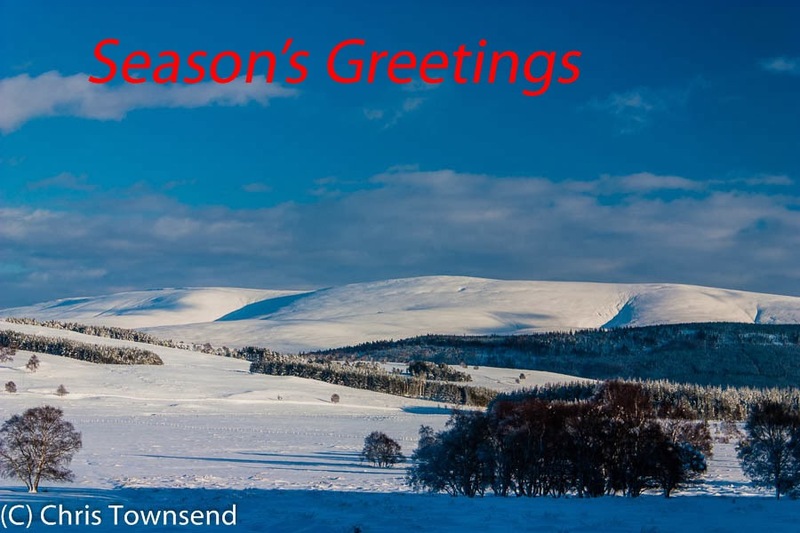 My major outdoor experiences in 2013 were making The Cairngorms In Winter film with Terry Abraham and walking the Scottish Watershed. Both required good gear that was well-tested. Some was familiar and trusted, some was new or previously little-used. I also tested much gear for The Great Outdoors magazine. Here I've rounded up the ten items that stood out for me plus one old friend that resurfaced. This synthetic insulated jacket only appeared in the autumn but since a sample arrived I've been using it regularly. Marrying Polartec's new Alpha insulation with Rab's excellent design the Strata Hoodie is warm, lightweight and breathable with a good hood and roomy pockets. I've worn it ski touring as well as backpacking and found it replaces a windproof top and lightweight fleece. In fact it does the job softshell is claimed to do, only better. This simple, lightweight, low cost jacket is close to an ideal fleece top for me, challenging my old and much-worn Jack Wolfskin Gecko. 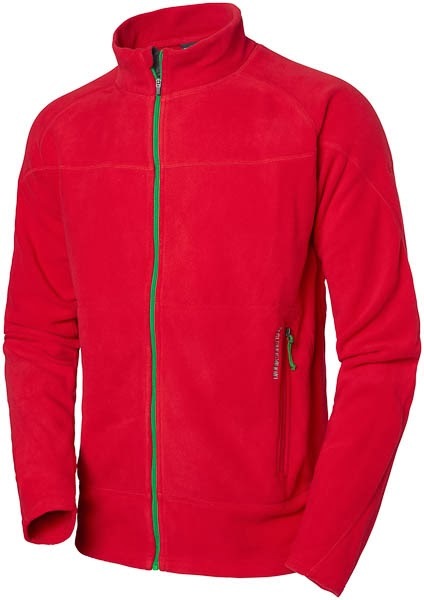 It's very comfortable and breathable and not too warm - a problem with many fleeces when worn under a shell. I can see this getting much wear in the future. (In fact I'm wearing it as I write this). Rab's Infinity bags were launched in 2012 and the 500 was one of my favourites last year. I used it often during the Cairngorms filming. I felt it was too warm for the Watershed walk however so I took the Infinity 300 on that trip and it was ideal, keeping me warm when the temperatures dipped close to freezing whilst not being too hot on warmer nights. It only weighed 650 grams and packed down very small. 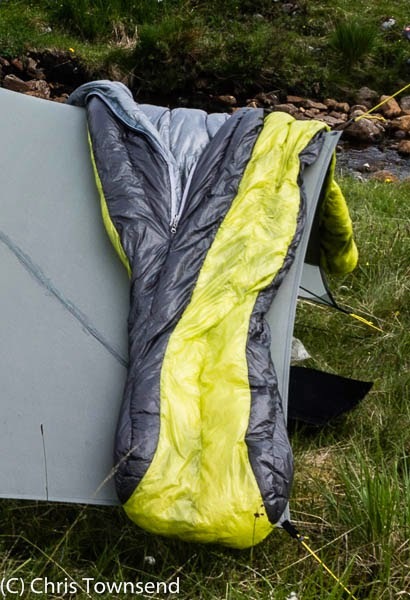 Polartec's Neoshell has been my favourite shell fabric with a membrane since it first appeared a few years ago. The Myriad is one of the lightest Neoshell jackets so I chose it for the Watershed walk. It was used far more often than I'd hoped and proved excellent. 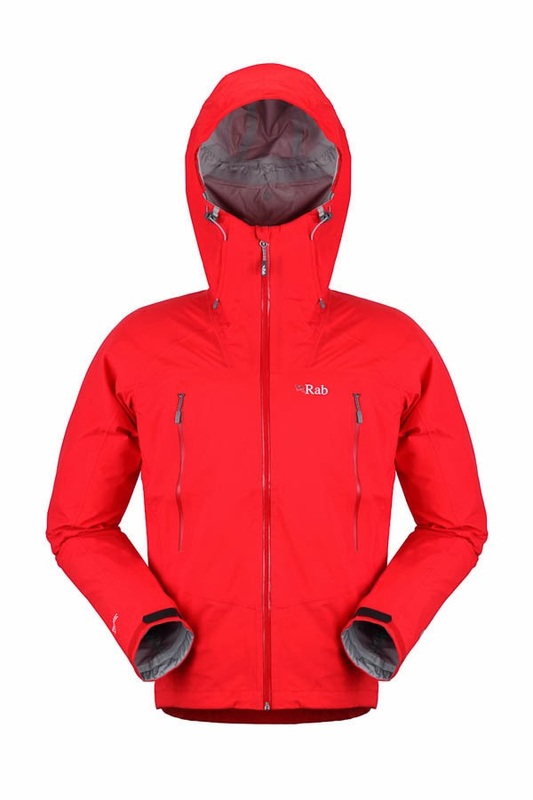 The design is good as well as the fabric, with a superb hood and roomy pockets that sit above a pack hipbelt. This ultralight down jacket arrived just before I set off on the Watershed walk so I decided to take it with me as at a mere 190 grams it weighed less than alternatives that weren't as warm and packed into a minute bundle. It was great in camp on chilly nights and made a good pillow. The down isn't water-resistant but I managed not to get it damp. 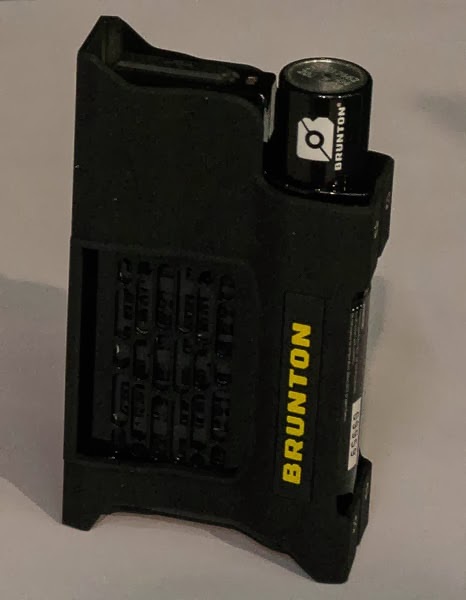 This little device won several awards during the year (I was one of the judges for two of them). I've only had one to try for a short time as very few are actually available so far but it worked fine and I like the idea behind it. Rather than a heavy battery it uses non-polluting hydrogen cells to charge devices - cells that don't run down when stored and which can be refilled. I'm looking forward to having one for a longer period and trying it on a long walk. Down filled sleeping mats are extremely comfortable but the first ones were also quite heavy and bulky. This one though only weighs 583 grams in the Medium size and packs down quite small. I used it for snow camping during filming for The Cairngorms In Winter and it was luxurious. During the making of the Cairngorms film I tried out several different stoves for melting snow and cold weather cooking and settled on this little Optimus model as the best. It's compact and light (181 grams) and has a low profile for stability. 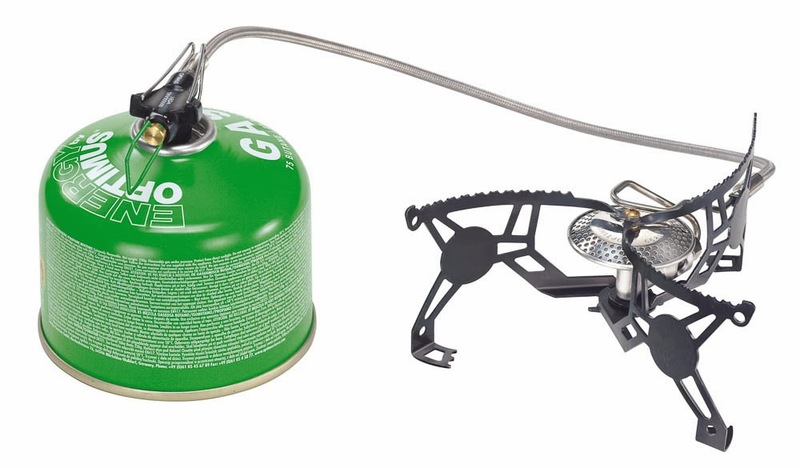 The big advantage though is that it has fold-out supports so the canister can be inverted to turn it into a liquid feed stove for sub zero use. I'd read many good reports about these socks from the USA but had never seen a pair until this year when they arrived in Britain. They're claimed to be extremely hard wearing. I've had a pair since September and have worn them for daily wear as well as on the hill and so far they are fine. Having read excellent reviews of this expensive lens I decided I wanted one for the Watershed walk so I took the plunge and traded in all my unused camera gear - everything from lenses to camera bags - and bought one. It weighs 225 grams and the quality both of the lens itself and the images it takes is excellent. I used it with both the NEX 7 and NEX 6 bodies and couldn't see any significant difference. This isn't a new item and I've had one for many years and it's first incarnation as the Hex before that. However with other tents to test and a love affair with the Mountain Laurel Designs Trailstar I hadn't used it for several years. I pulled it out for The Cairngorms In Winter film mainly, I admit, because I thought the bright colour would look good. I soon rediscovered how good a shelter it is though, especially in winter when the extra room is welcome as is the good stability. I won't neglect it again. 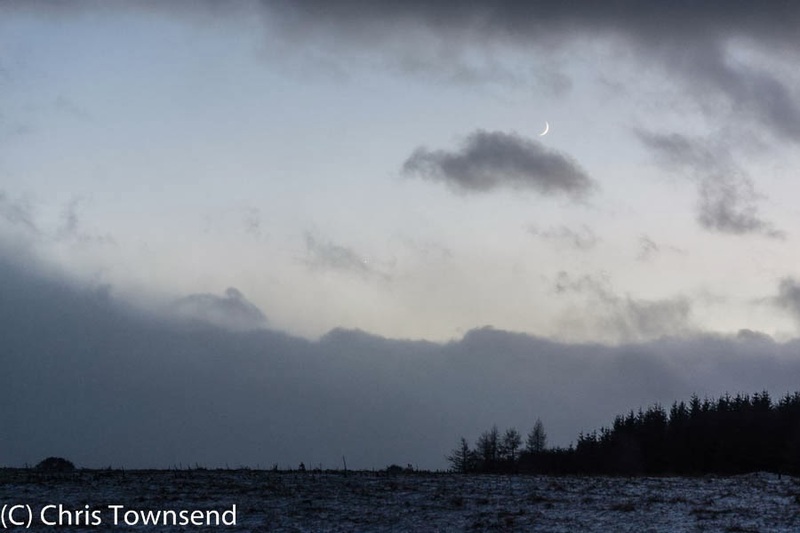 After days of battering storms and a rapid freeze/thaw cycle that saw snow come and go every few hours, or so it seemed, the weather on Christmas Day began to slow and settle. The winds eased, the showers grew lighter and less frequent, the world quietened. By Boxing Day morn the silence was palpable. The low sun shone, hinting at heat but no more. The air was still but cold, nipping the skin. A short walk in the fields was a respite from Christmas feasting, board games, TV and DVDs - all welcome whilst the storm raged, giving meaning to the midwinter festival. Inside, warm, well-fed, entertained and knowing that the darkness is already slowly lifting, the days lengthening imperceptibly, we were content. Soon the sun's warmth will be real. Later we visitited friends, walking tracks and roads in the dusk as the first ice started to form. The woods, darkened to mysterious blackness; the air colder in the shade of the trees. Returning hours later in the night, replete with conversation and food, we watched the frost dancing like stars in the light of a headlamp, the air full of shining ice crystals drifting downwards. Above stars shone between the drifting clouds. The same scene as the last two posts, photographed at 2pm today. Snow showers are dusting the land, coming in on a strong wind. The temperature is around freezing. More snow is forecast. The same view as in my past post, twenty-four hours later. A big thaw! Strathspey, 12.30 p.m., December 20th. Midnight. The wind is roaring in the trees. The shortest day of the year is beginning. I've just been outside for a very brief walk. The night is black. Cold rain lashes down. And the snow is gone. The thick, heavy snow that fell only two days ago and turned the world white. Gone. Melted in just a few hours by the wind and the rain. The temperature at midday was -0.3ºC. At midnight it's +5ºC. In the afternoon I'd walked down through the woods to collect a delivery from a van that couldn't make it up the snowy track. I took a sledge and hauled the boxes back up to the house. The snow was deep. It was hard to imagine it could vanish so quickly. 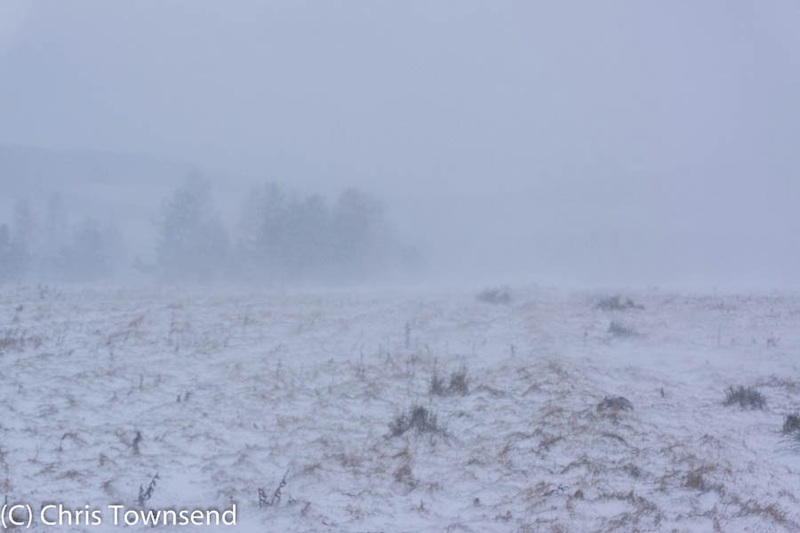 The snow had come the day before, blown in on a Northwest gale that created near blizzard conditions. The snow was sticky and wet, plastering everything. The ground was sodden, not frozen. That's why the snow went so quickly, just a small rise in temperature enough to turn it back into water. It didn't bond to the ground and the high water content meant it thawed fast. So now its back to grey and wet and wind, waiting for the next snow to bring winter back. 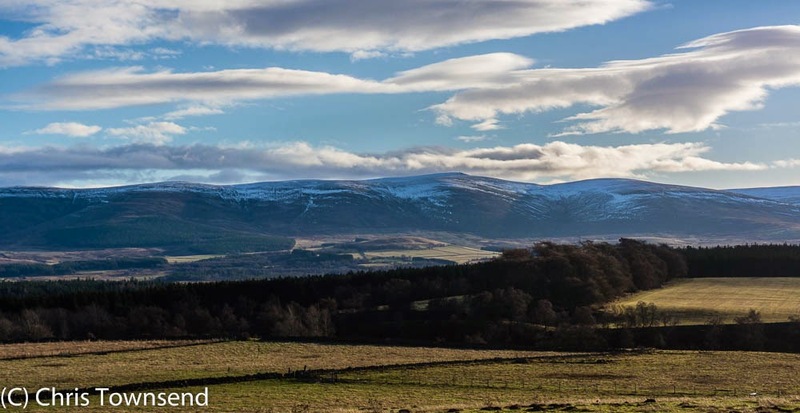 Today, December 20th, is the last day for the consultation on the Scottish wild land map produced by Scottish Natural Heritage. Below is my response. My hope is that this map will form the basis for wild land protection. It's not enough on its own but it would be a great start. 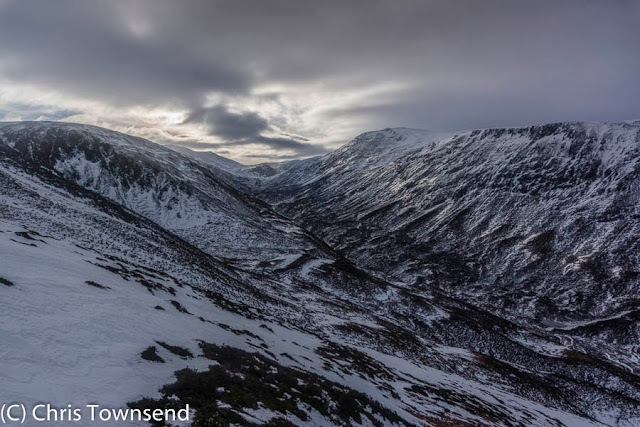 "The Core Areas of Wild Land map is invaluable for providing a picture of the wild land left in Scotland and its location. Congratulations on producing this map and for consulting on it. The map should now be used to assist government and other bodies in protecting wild land. Any developments that would impinge on the wild character should now be excluded from the wild land areas on the map. 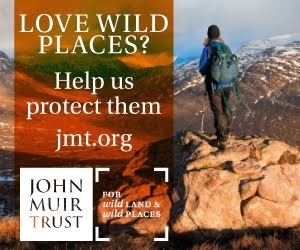 Wild land is essential for all of us for a wide variety of reasons including freedom from the constraints of urban living; protecting wildlife; conserving the landscape; providing opportunities for activities like mountaineering and hillwalking; and simply escaping to quiet and beautiful places for peace of mind and the restoration of the spirit. Wild land in Scotland has been whittled away over the years by many different developments such as bulldozed roads and wind farms. This has speeded up in recent years, making it vital that clear protection is given to what remains. This should be unequivocal and make it impossible for the boundaries to be challenged by repeated development applications. 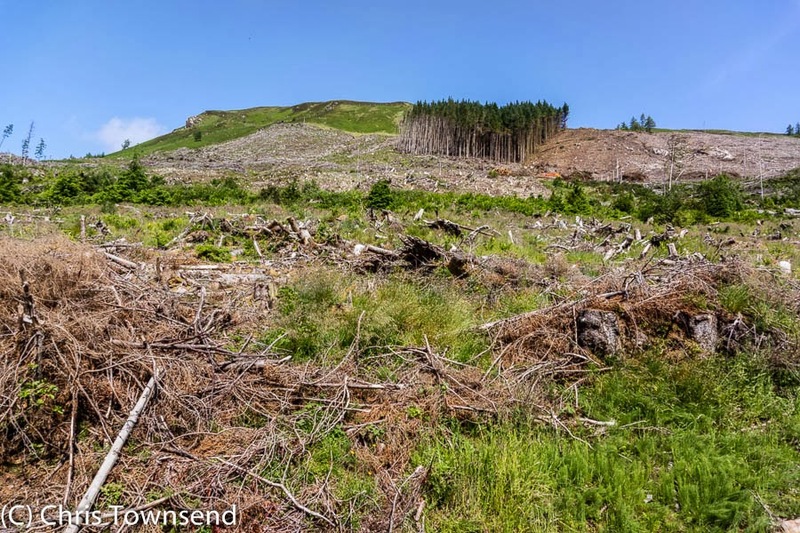 It's also important that there are buffer zones round core wild land where developments are limited and those that would affect the quality of the wild land prohibited. Wild land does not suddenly stop at arbitrary boundaries as drawn on a map. Instead it gradually fades away, slowly becoming less wild. All the areas of wild land identified are significant and all should be protected immediately. Otherwise the next time the map is looked at there will be less wild land. There is no time to debate just where the boundaries should be. There are other areas that could be included on the map, in particular on the coasts and in the Southern Uplands. Also, areas that are wild now but on which consent has been given for developments should be included as the developments may not go ahead. 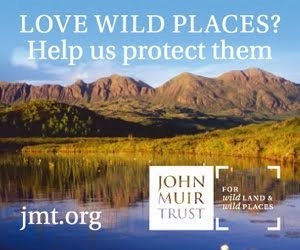 The map should cover wild land as it is at present." The snow has returned to the Cairngorms and the hills are white, though still storm-blasted and inhospitable. 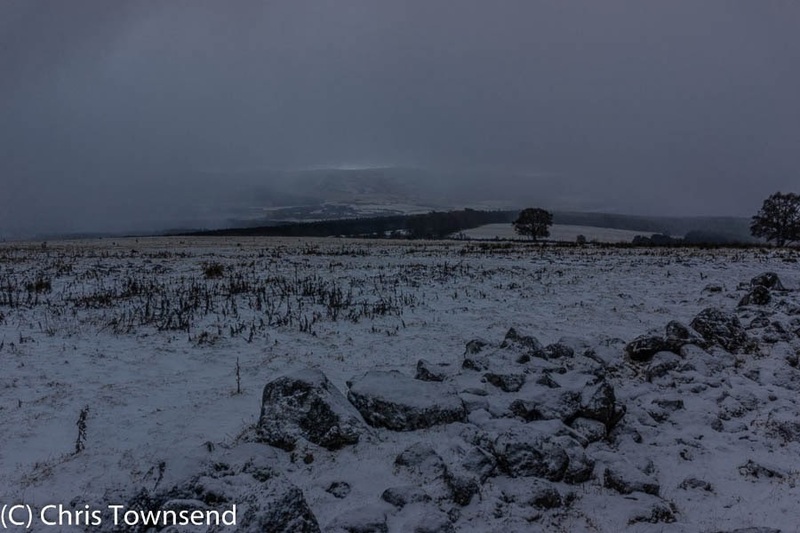 Before the temperatures dropped and the snow began to fall I went out into the soggy, windswept hills to do some filming for the BBC's Countryfile Winter Special, which will be shown on January 19. 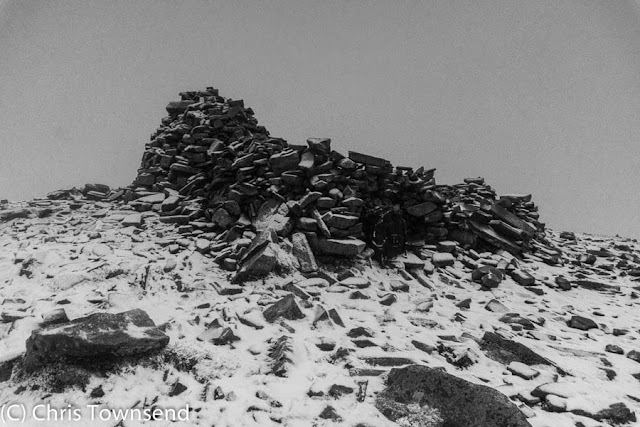 The wind was too strong to film on the summits - standing up would probably have been a challenge - and anyway the cloud was low so we'd have seen nothing. 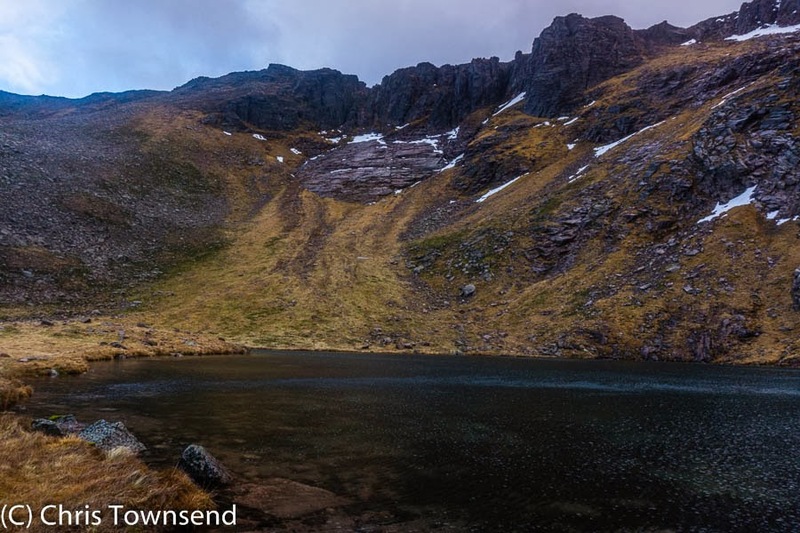 Instead with a three-person film crew and accompanying ranger in tow I wandered over to Coire Lochain where there was still some snow - enough for me to clamber about with ice axe and crampons - plus the usual dramatic backdrop of this magnificent corrie. On the upper edge of the long snow bank I climbed we could see and hear ptarmigan, lots of ptarmigan, lots and lots of ptarmigan. The more we looked the more we saw. I'd never seen anything like this many in one place before and neither, had Nick, the ranger. He counted 150 so we reckoned there were probably at least 200. A magnificent sight. 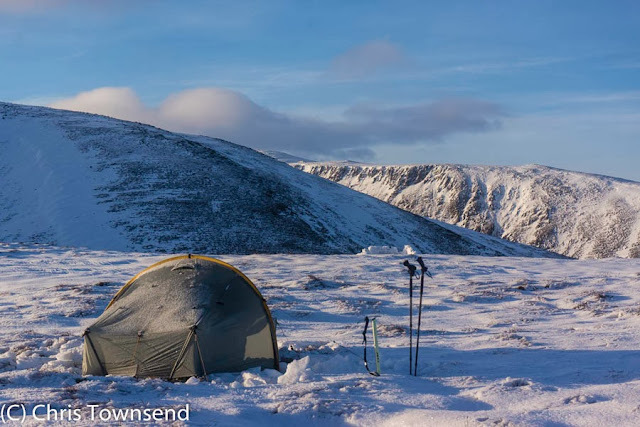 From the corrie we descended a little in search of a reasonably sheltered camp site for me as the director wanted to film me setting up camp before the crew retired to a hotel in Aviemore. Most ground flat enough for a comfortable camp was absolutely sodden from recent rain and snowmelt and it took a little time to find a just-about-adequate spot, right on the banks of the Allt Creag an Leth-choin. The stream was roaring down in a series of little whitewater cascades. Luckily I find this noise quite soothing! Before departing the crew left me with an infra-red video camera and infra-red torch so I could make a night time video diary. I used it several times inside and outside the shelter but whether any of the material will actually appear in the programme I have no idea! I'd never tried filming myself before. I hadn't expected to start doing so with an infra-red camera. When I made camp the wind wasn't too strong and I was looking forward to a peaceful night, especially as I knew the film crew would be returning to film me having breakfast and packing up. I didn't want to look too bleary-eyed or sound half-asleep! 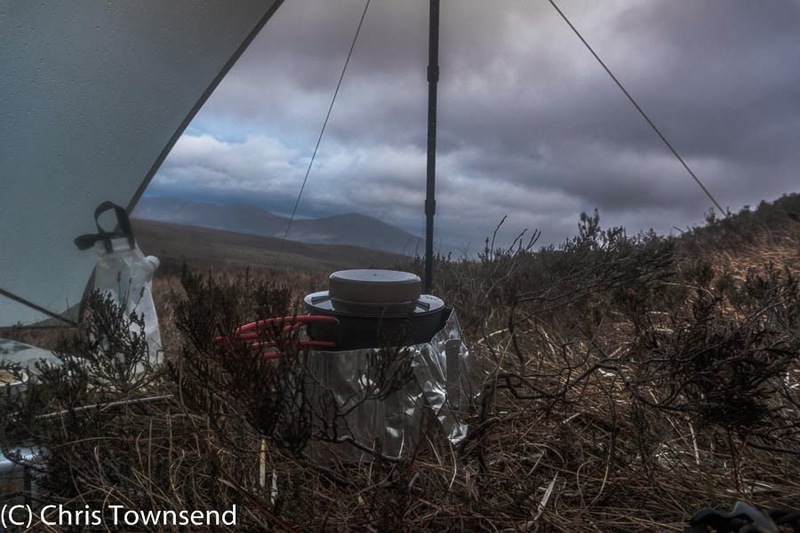 However during the night the wind shifted slightly and my sheltered site was sheltered no longer. Rain came too, rattling and bouncing on my shelter walls. The storm woke me several times and at 3.30 a.m., fed up of the racket, I hastily donned my waterproofs and went out to lower the profile of the shelter so it shed the wind and rain better and wasn't so noisy. I then fell back asleep, waking as the first grey dawn light crept over the sodden landscape. It was still raining and there was no colour in the morning sky. 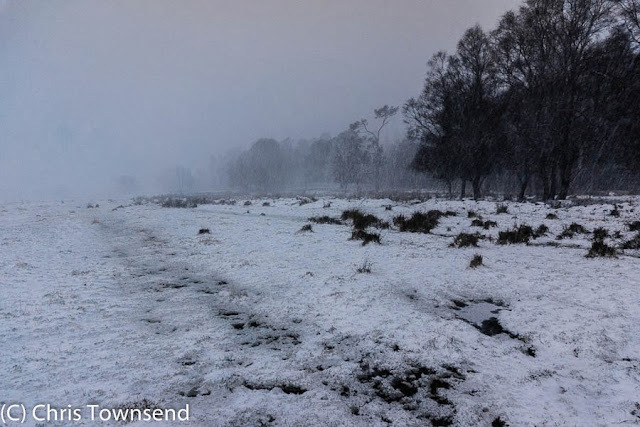 The film crew returned, their waterproofs dripping, and I displayed my gear for the camera and was filmed packing up before we headed back across the moorland to warmth and coffee, pausing for a little while in a wet but sheltered peat bog hollow to record me talking about the joys of the Cairngorms in winter and the pleasures of long distance walking. If only the snow had come sooner. 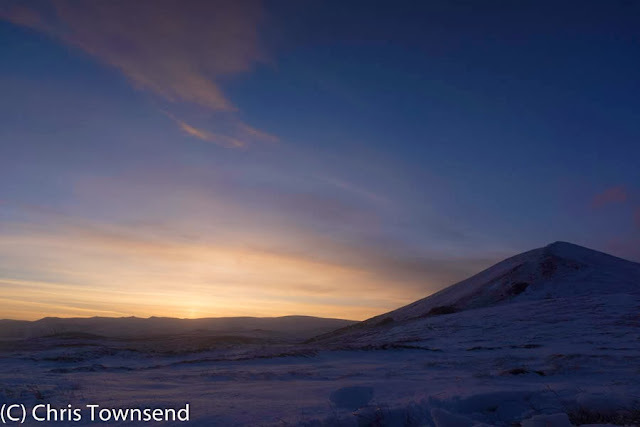 Back in October I did some filming for The Adventure Show about the Cairngorms in winter. This will be shown in the next edition of the programme this Tuesday on BBC2 Scotland at 7pm. After the broadcast it'll be available on BBC iPlayer. As well as some of the filming I did for the show (I'm curious to see what is used) the programme will have clips from Terry Abraham's The Cairngorms In Winter film. And very warm for the time of year. 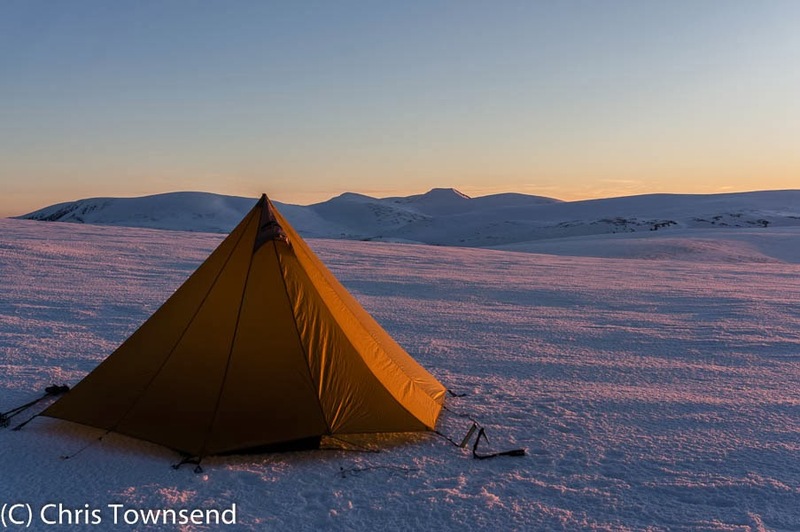 And the Scottish Avalanche Information Service is about to start for the winter. 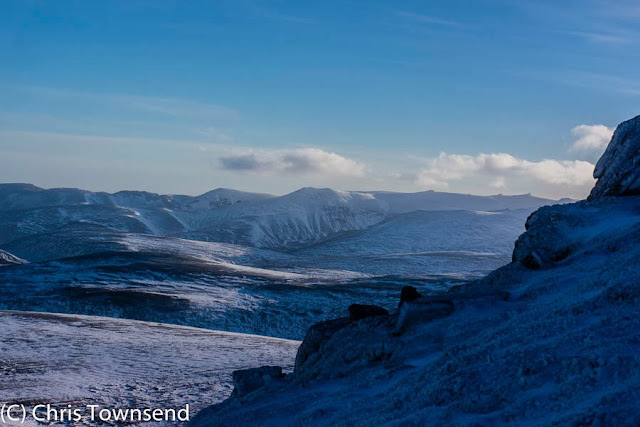 Photos taken December 11 in the Northern Corries of Cairn Gorm. The latest issue of The Great Outdoors (January 2014) is out now. 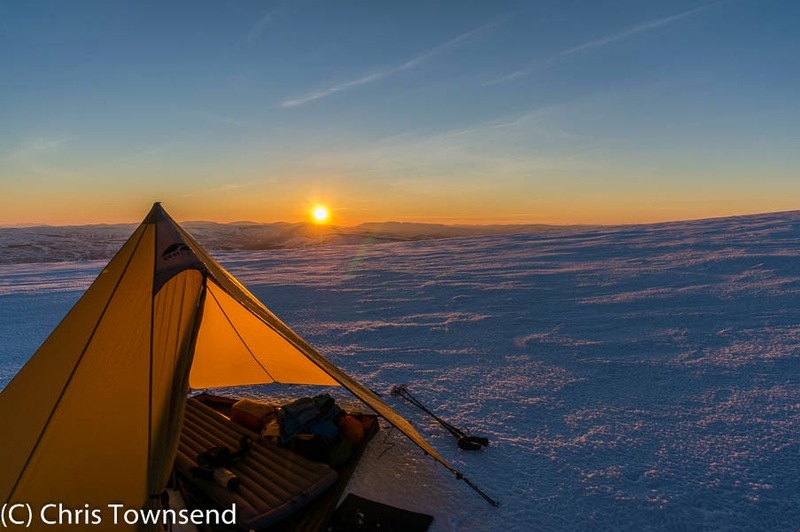 My contributions are a skills piece on snow camping; a colum on returning to the Lake District; and reviews of 11 pairs of gaiters plus the Rab Strata Hoodie insulated jacket and the Petzl Tikka R+ headlamp. 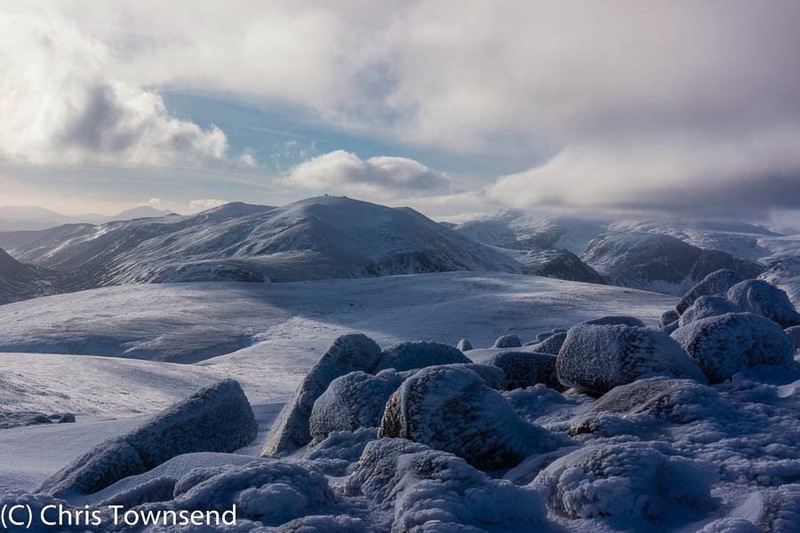 The theme of this issue is winter, unsurprisingly (though winter has vanished in the Cairngorms at present with a big thaw having stripped the snow from the hills). 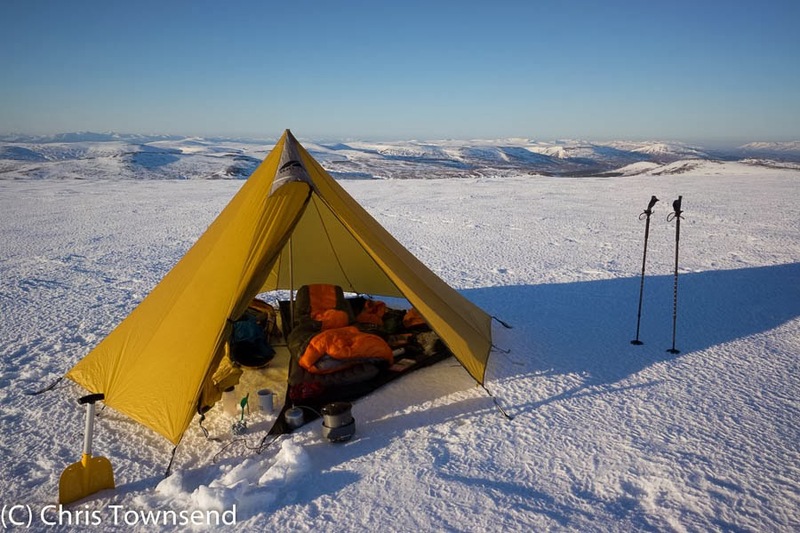 Ronald Turnbull looks at four pub-to-pub winter trips in the Lake District and Scotland; David Lintern praises winter wild camps, a piece illustrated with his magnificent photographs; Andrew Terrill has a midwinter climb by moonlight in the Colorado Rockies and editor Emily Rodway has a wintry walk in the snowy Fannichs. In the Hill Skills section Alan Halewood of Glenmore Lodge concludes his series on avalanches; Heather Morning of the Mountaineering Council of Scotland looks at specialist avalanche kit, Pete Catterall of Plas y Brenin explains the importance of staying hydrated in the cold and Art Editor Geoff Barton gives some tips for photographing the winter night sky. And in the Gear pages Daniel Neilson reviews 11 3-4 season boots. Away from winter Ed Byrne goes to Jersey and tries blo-karting (which I'd never heard of before); Roger Smith looks at Living Landscape projects designed to restore the natural landscape and wildlife and Jim Perrin praises David Craig's On the Crofter's Trail. The Great Outdoors Awards 2013 are covered in detail too, with winners ranging from the Wasdale National Trust Campsite to the Hi-Tec Zuuk shoes. The wind began last night, rattling the trees and roaring round the chimney stacks. With it came rain and, oddly for midnight in December, a rise in temperatures. I woke several times in the dark as bigger gusts of wind banged and cracked. 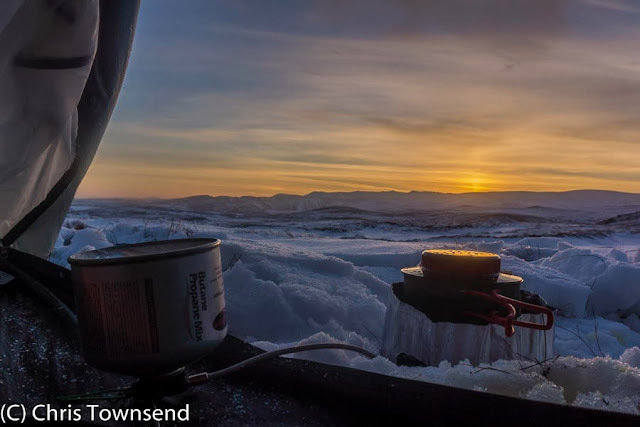 By dawn the temperature had dropped below freezing and everything was icy with frozen rain. Light snow was falling and the wind was still very strong. By afternoon the wind had dropped to merely gale force. A bitterly cold north-west wind driving thick clouds and heavy snow showers across the sky. The temperature was -1C, the highest it reached all day, when I ventured out to see what I could of the stormy world. Underfoot the ground was crunchy and slippery, icy patches hidden under a thin skim of snow. The snow came horizontally, driven hard by the wind. Cold and dry it streaked across the land. Gusts of wind picked up fallen snow and sent it whirling through the air in great clouds. At times as the swirl of snow from both ground and sky whipped all around me I was in a near white-out, only able to see hazy distant trees and tufts of vegetation. The snow stung my face and I walked with my gloved hand shielding my cheeks and my jacket hood pulled tight. The world felt confined and small, enclosing me in a cocoon of snow, yet at the same time vast and endless, a white cloud stretching to infinity. The hills were invisible except in a brief gaps below the clouds. Mostly the world was restricted to a few hundred metres or less. As I walked home the clouds parted to reveal a thin crescent moon hanging in the cold winter sky. I am delighted and honoured to be the British Mountaineering Council's first ever Ambassador for Hillwalking. As is this is a new role I'm not sure exactly what will be involved but I will be popping up at various time to promote hillwalking and the work of the BMC. Whilst the BMC has always represented hillwalkers in England and Wales and has done valuable work in the areas of access and conservation it's public face has tended to be more about climbing. This changed last year when Carey Davies was appointed as the BMC's first hillwalking officer. I'll be working closely with Carey, who I know from his days as Deputy Editor of The Great Outdoors. This will be an interesting challenge and I'm looking forward to working with the BMC over the next few years. The official announcement can be seen here. 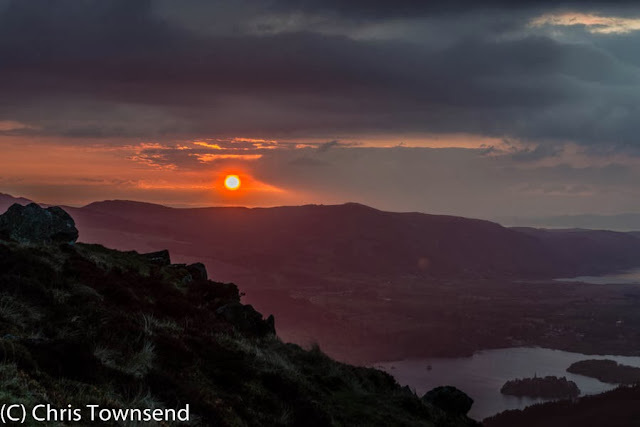 The picture was taken on a visit to the Lake District last May. I do go walking south of the Scottish border sometimes! Within 24 hours of my taking the photograph of the Cairngorms after a big thaw that appeared in my last post the snow returned. 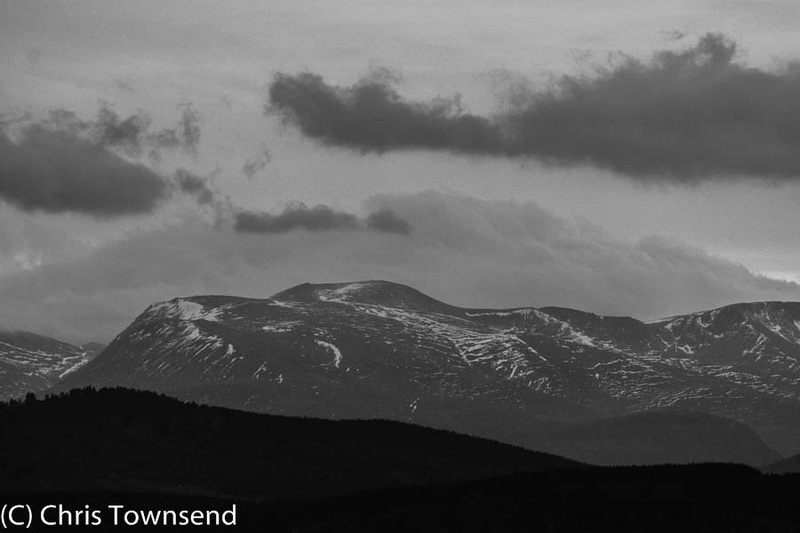 Heavy rain, low cloud and chilling rain didn't make the highest tops seem very attractive so I headed for 810 metre Meall a'Bhuachaille above Glenmore, a wonderful viewpoint for the Northern Cairngorms when the skies are clear. On this occasion the clouds didn't lift and visibility was restricted to 100 metres or less. As I wandered through the forest to Ryvoan Pass the rain fell steadily and the cloud was brushing the forest edge on the slopes above. 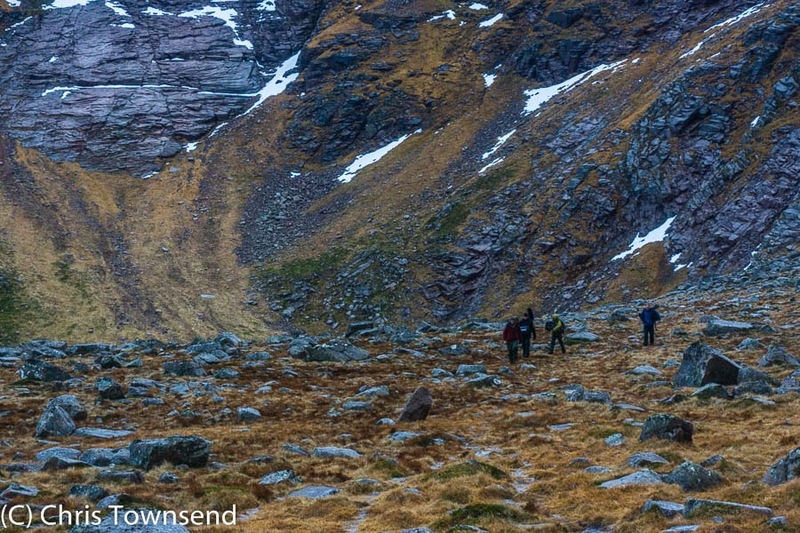 By the time I reached Ryvoan Bothy the rain was sleety and beginning to whiten the heather. The climb steepens here. Soon I was in the cloud and the precipitation was snow. The summit was cold and wintry, the sky thick with snow. A brief stop and then down, skidding on the slippery stony path. The cloud base was around 500 metres, the snow was settling down to 400 metres. More is forecast. Winter has returned to the Cairngorms. The last few days has seen a big thaw of snow in the Northern Cairngorms. All the low level snow had already gone and when the mountains appeared out of the clouds today for the first time in many days it was clear that the thaw had reached the summits. That said, more snow is now forecast for later this week so by next weekend the hills could be white again. The Scottish winter is never predictable! The photo was taken on December 2 at 3.15pm. 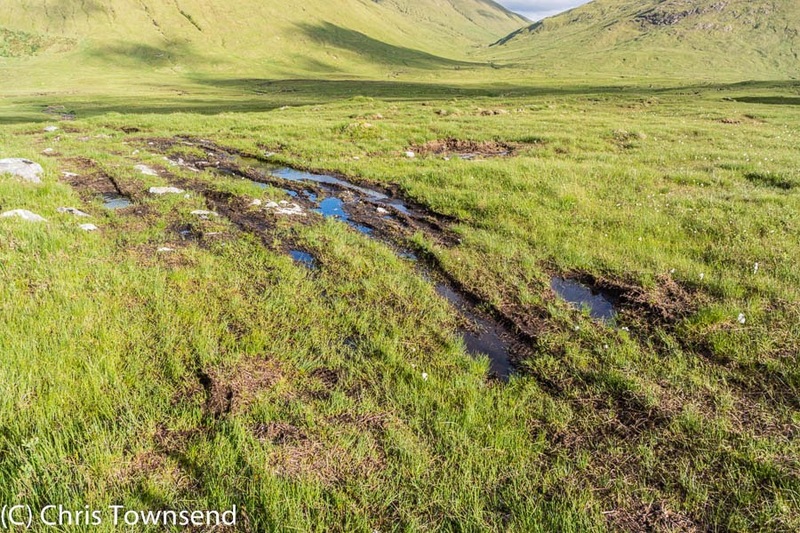 Last week a report on hill tracks in Scotland was published by Scottish Environment LINK on behalf of nine conservation organisations. 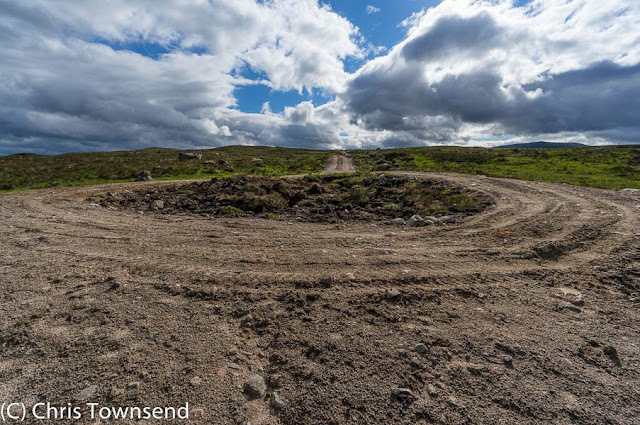 Track Changes by Dr Calum Brown shows how current legislation is insufficient to prevent damaging roads being built in the Scottish hills. The report is detailed but it's enough to look at the pictures to see that there is a big problem. 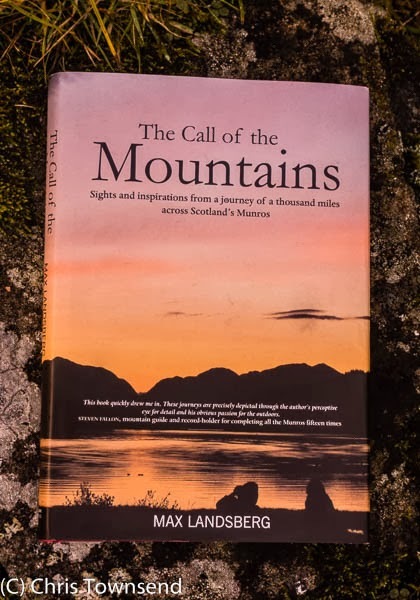 The report stirred up debate on social media and blogs, with an especially good piece from Cameron McNeish on the Walk Highlands website. Reading the report and the response had me thinking about my Scottish Watershed walk last summer and the environmental damage I had seen. 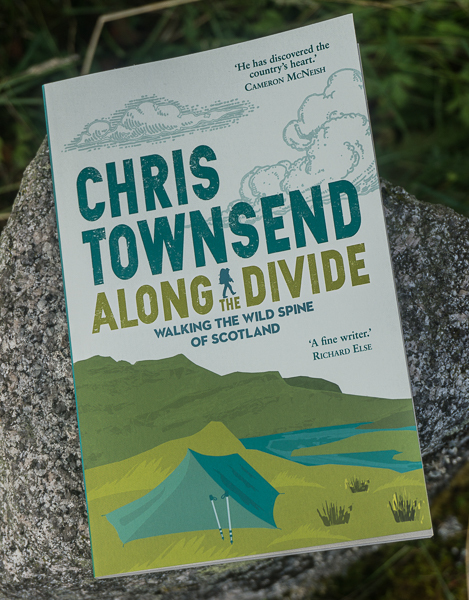 A walk the length of Scotland, almost all of it in wild land, was an excellent way to gain a snapshot of what is happening. Firstly, let me say that most of the damage I saw was long-standing and not that obvious, namely over-grazing by sheep and deer. To be truly wild the Scottish hills need far more natural forest. Overall the potential for this is excellent. It just requires the will to carry it out, a will that is being exercised in an increasing number of places. Whilst my walk showed that most wild country has not been damaged by developments, despite what some commentators say, there are problems, and they are increasing, leading to a slow nibbling away of wild land. 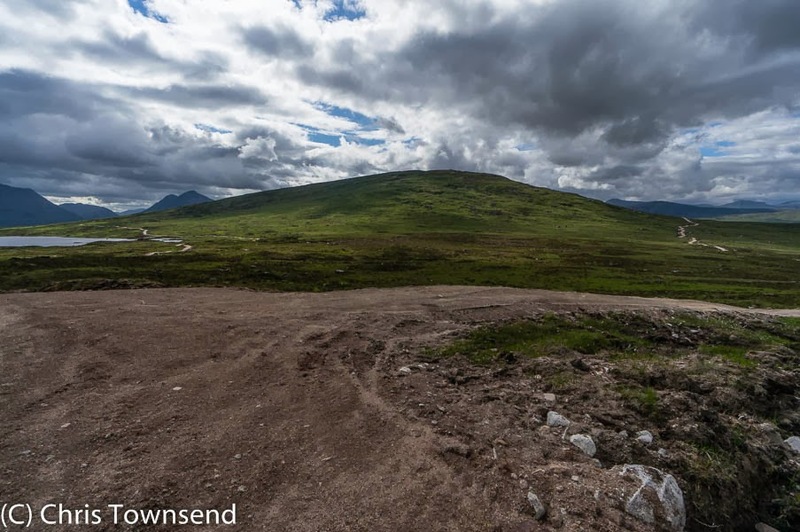 Wind farms are the main concern of many people and in some areas, especially in the Southern Uplands, they have had a real detrimental effect on wild land. 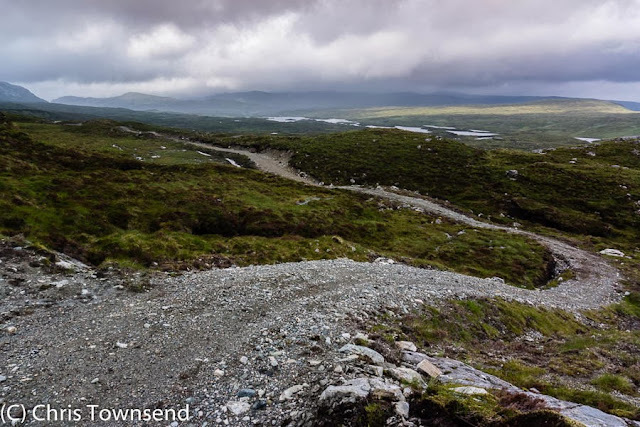 However my observations on the Watershed put them third after forestry plantations and vehicle tracks in terms of both visual and physical impact. The hard, straight edges of plantations look unnatural from a distance and draw the eye, breaking hillsides up into rigid blocks. Where there is clear-cutting hillsides look awful, a blasted mess of tangled dead tree remnants. Of course the forest will return to cleared areas and if left alone for many decades a plantation will slowly revert to a more natural state. However, although forest owners are mitigating the effects of plantations in some areas by softening the edges with deciduous trees, overall forest policy is still for blocks of trees and clear-cutting. Inside a plantation it can seem quite natural - I walked through many on the Watershed and much preferred being inside them rather than looking at them from outside. Animal, bird and plant life inside the lines of closely packed conifers is greatly reduced from that found in a natural forest though. Rather than plantations the regeneration of the natural forest (which would now include Sitka spruce, larch and other 'non-native' trees) is the way to increase wildness. Vehicle tracks, whether bulldozed roads or ones formed by repeated driving over vulnerable areas, are the fastest spreading developments in the hills, hence the need for the Track Changes report. Estates are mostly building these roads in order to get shooting clients in and out of the hills fast. The idea of walking and using ponies seems to have been forgotten. Estates claim the tracks are for 'agricultural purposes' and so don't need planning permission. Some roads are wide enough for two big lorries to pass each other and have huge spoil heaps on either side. The damage they do physically is enormous and they also look hideous. Control of such tracks - and the removal of many of them - is very important for the survival of wild land. Wind farms also require many tracks but these are included in the permission for the turbines. They do the same damage as any other tracks of course. Wind farms themselves are a problem in some areas and a potential problem in many others. However for most of the Watershed walk I didn't see any so they have not yet had the impact many people believe they've had. The worst damage I saw was the work along the Beauly-Denny power line, which the Watershed touches at one point. Huge bulldozed roads and massive pylons turn the areas it passes through into industrial landscapes. The roads are supposed to be removed once the pylons are in place (which will be a huge job in itself) but some estates are saying they wish to keep them as they will be 'useful'. What can be done about all this? Hopefully, the planning proposals to protect SNH's core wild land plus designated National Scenic Areas that I wrote about back in April will go ahead, and will include regulations on tracks. On this there is a Consultationon Core Areas of Wild Land 2013 Map taking place and I would urge everyone concerned about the protection of wild land in Scotland to comment. 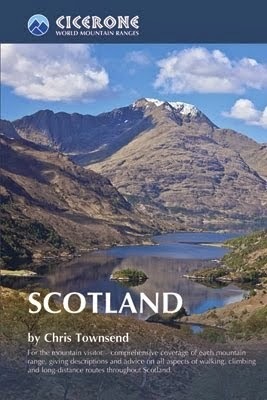 All the photographs were taken during my Scottish Watershed walk last June and July. As it's time for Christmas gift buying here's a few suggestions from my work for lovers of mountains and wild places. The first one is the film I made with Terry Abraham earlier this year - The Cairngorms In Winter - which is available on DVD with some outtakes and other extras from some outdoor shops and from Striding Edge - see box to the right. 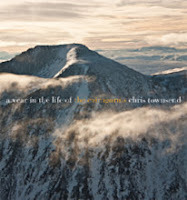 For the Scottish hills as a whole, including the Cairngorms, there's my big Cicerone World Mountain Series book, Scotland. 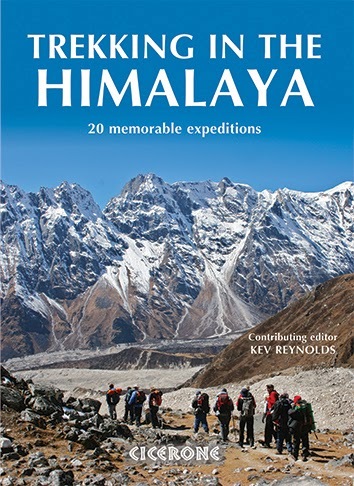 This is also full of pictures plus information on suggested walks, geology, natural history and more. 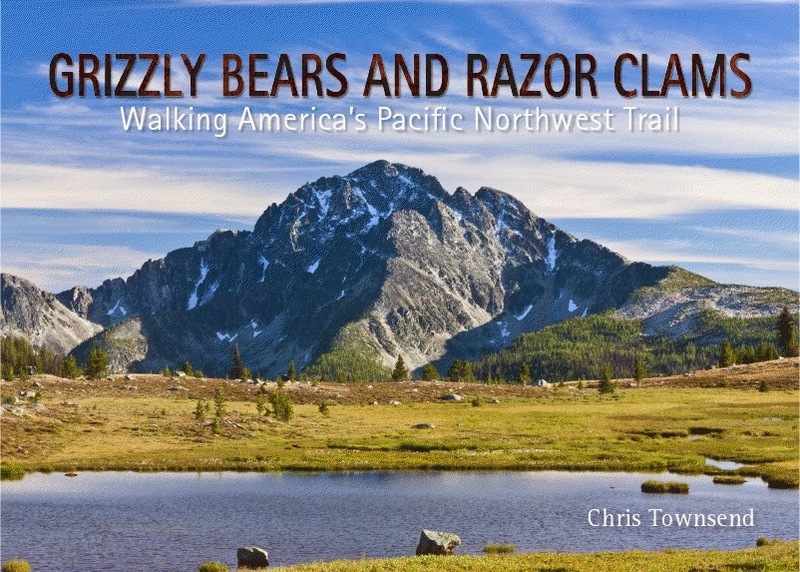 Finally if you fancy venturing abroad there's my account of my 1200 mile walk along the Pacific Northwest Trail, Grizzly Bears and Razor Clams.